how complaints are dealt with at the EPO. Even though it is not binding either on the EPO or on users and their representatives, it gives some interesting insight into the workflow the EPO wished applicants and representatives to follow (cf. also here). The importance of making a complaint. Anyone dissatisfied with the services of the EPO, whether or not he is a party to the proceedings in question, is encouraged to make his dissatisfaction known to the Office. The EPO takes feedback seriously and strives to use it as a basis for continuous improvement. There will be no negative consequences for the complainant merely because he files a complaint. 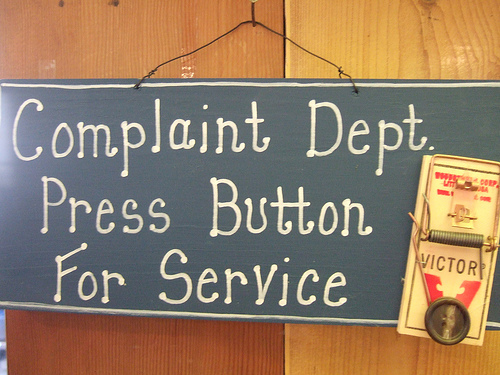 The EPO will investigate all complaints. [...] Once a final decision has been taken or an application is withdrawn, it is too late: complaints are best made as early as possible. Procedure for making a complaint. Complaints can be submitted to the EPO by any convenient means. Written complaints are easiest to deal with, especially if sent by e-mail direct to Directorate Quality Management Support [..] at dqms@epo.org. If a complaint is contained in a response filed in connection with a particular application, the response must be filed by the official means, preferably online. In this case, the complaint will be investigated more quickly if a copy of the response is sent by e-mail to DQMS. How the EPO handles complaints. All complaints are investigated and followed up internally within the EPO. Directorate Quality Management Support (DQMS) is responsible for dealing with complaints. DQMS is a department outside the operational line. It looks into the case, together with the head of the department responsible for the case in question, to establish what has happened, whether the complaint is justified, and whether followup action such as a change in procedure is needed. It reports annually to the President of the EPO on complaints received. Response time. DQMS aims to reply to complaints within 30 days. In the rare cases where it cannot manage this (e.g. because of extensive consultations), the complainant will be kept informed. Limitations. The treatment of complaints takes place outside the scope of the normal patent procedure. Although DQMS investigates all complaints, it has no authority to influence or review the legal decisions taken by other EPO departments. DQMS normally provides complainants with feedback on the results of its internal investigation. In a few situations, this may not be possible, for example if a binding decision has already been taken, or if other parties are involved. In the interests of legal certainty, DQMS can advise other departments to issue corrections or refund fees only if there is a legal basis for them to do so. In particular, the valid payment of a fee has a legal effect, so a refund is usually not possible unless a mistake has been made. Making a complaint is not a substitute for available legal remedies. if the procedure provides for means of legal redress in a given situation, the complainant may consider following these in parallel with complaining to DQMS. A complaint related to a specific application will be added to the electronic file. If it contains material which needs to be taken into account in the procedure, it will be placed in the public part of the file. Update (23.03.2012): Even though the new Handbook has been officially published just now (1st edition, March 2012), it has been published on the EPO website for only one or two days already in February 2012 and then withdrawn. The EPO has a duty to process and examine European patent applications. It is to its own benefit and to that of users and third parties that it conducts the granting procedure as efficiently as possible, while maintaining its long-standing commitment to quality. Representatives have a duty to serve the interests of their clients or principals as best they can while complying with the European Patent Convention (EPC) and professional standards. Users involved in the patenting process at the EPO vary from individual users through small and medium-sized enterprises to multinational companies, all of them subject to different financial constraints and IP policies. They also operate in a variety of technological areas which have different time frames and exploitation potential. In proceedings before the EPO, both users and the EPO can adopt many different procedures while complying with the EPC. This document provides indications of quality-building practices which reflect those already applied in the majority of cases by EPO staff and representatives alike. EPO. This document indicates some of the procedural consequences of taking such different courses. Its intention is to help to increase the quality of incoming applications, communications from examiners and submissions from parties, as well as to provide for an efficient prosecution. It may also serve as an orientation for attorneys who have less experience with the procedures at the European Patent Office and for candidates preparing for the European Qualifying Examination. Theses amendments do not appear to be the result of highly political back room issues and surely do not qualify conspiracy theories at all. For emphasising the cooperative approach of the project it certainly was a good idea to cancel the two paragraphs on the duties, especially since the duties of the representatives were four times longer that those of the EPO.